If you want to know about everything related to 3D printing then you should visit this site daily. If you want to know about it before we write it up then you’ll have to go to where it’s all happening. That can be a lot of places though, from local FabLabs to regional Maker Faires. To make it easy for us, all the big (and some small) 3D printing players are invited to come to the same building for a couple days at a time and share their latest accomplishments and plans while showing off their printers at the Inside 3D Printing Conference & Expo. 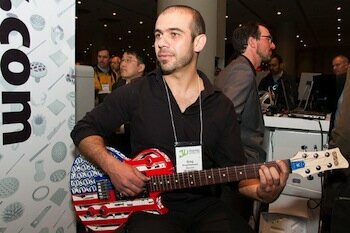 The first I3DPC&E was hosted in New York, and companies such as 3D Systems, Stratasys, and MakerBot were there showing off their hardware to over 3,000 attendees. 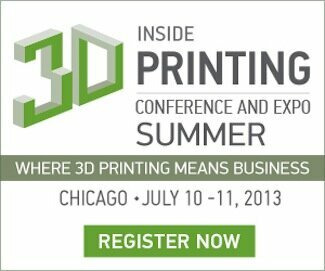 The next I3DPC&E will be hitting Chicago on July 10 and 11, and it looks to be an exciting event. As “the” B2B tradeshow for the 3D printing industry, the event garners top venture capitalists, entrepreneurs, engineers, designers, professors, manufacturers, makers, and artists to explore the impact of this rapidly growing field. The summer edition, programmed by Hod Lipson, xxhibitors including 3D Systems and Stratasys will unveil their latest developments and services, while conference sessions will feature innovators, educators, and professionals from Nervous System, Mcor Technologies, Xerox, The 3D Printer Experience, Disney, HaveBlue.org, and the U.S. Congress. The event will also feature the designer and architect who created style icon Dita Von Teese’s famous 3D printed dress to discuss 3D printing’s influence on fashion and art. Francis Bitonti and Michael Schmidt will discuss the creative opportunities which exist with innovative materials and technique. Among the presentations will be: Tools of Creation, Industrial Scale Additive Manufacturing Technologies, The Printed Athlete: How 3D Printing is Changing the Nature of Sports, and many more. The event’s networking reception and exhibit hall, featuring the likes of Stratasys, Mcor Technologies, Solid Concepts, InterPRO, and NRI, provide the ideal forum for professionals to network with like-minded peers and investors and explore the latest 3D printing equipment. There will also be tutorial sessions on a range of topics. Newly added sessions include Bringing 3D Printing to the Cooking Realm, 3D Printing in Architecture, Learning by Making, 3D Printing and Policy, and Personalized 3D Print Adoption in Retail and Brands. View the full program here. I’ll be there reporting on as much as I can take in. If you see me, don’t hesitate to come have a drink; I’ll be the hippy-looking fellow in a wheelchair. The 15% discount on Gold Passports is still in effect. Just enter 3DNET during registration here.